Located next to Duluth’s International Airport is a building that used to contain one of the Air Force’s primary systems for detecting intruding aircraft during the Cold War. The computer that the building contained was a part of the Semi-Automatic Ground Environment (SAGE) System, which was used in part to detect incoming aircraft as soon as possible and eliminate any threats. 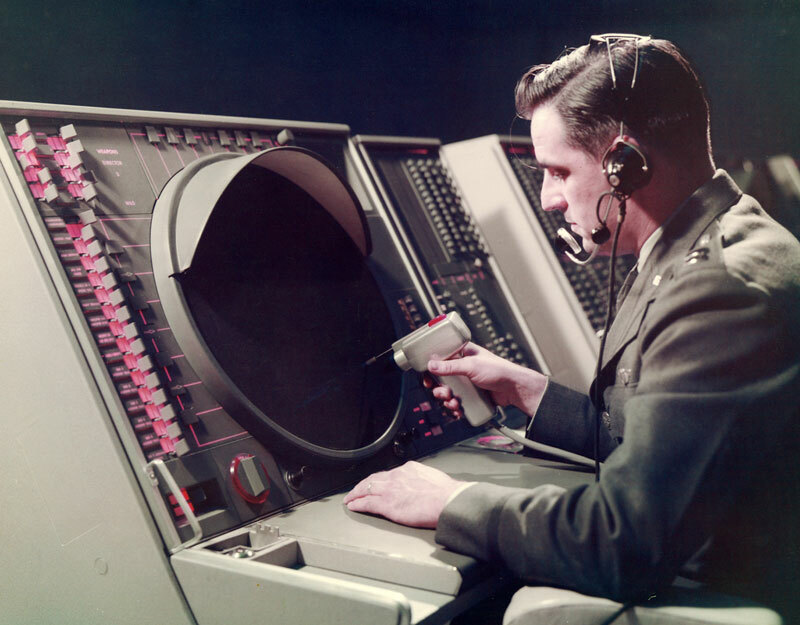 The Semi-Automatic Ground Environment System was a military project implemented during the Cold War that was designed to watch the skies for any hostile aircraft, as well as calculate interception patterns for incoming targets. The system centered around 23 installations around the United States that contained IBM AN/FSQ-7 computers that were referred to as direction centers (Jacobs). Each of the installations housed two of these computers. One would run continuously, processing data from radar stations, Texas towers, early-warning aircraft, and other military installations, as well as keeping up-to-date information about all civilian flights around the country. The second computer would also be running, always double-checking the first computer’s calculations and always ready to immediately take over if the first computer failed for some reason (IBM Corporation). Each SAGE installation had its own set of radar stations and inputs with which it would communicate. However, each individual station could also communicate with all other stations through a very early version of the internet using telephone lines as a means to send signals to each other (Valley). Through this communication, the computers would create a map of the air space in and around the United States. This was constantly monitored for any approaching aircraft. When an aircraft was spotted, it would be tagged as hostile or friendly. If hostile, the computers would be able to track it using one of the largest computer programs written at that time. This allowed the computer to plot an intercept course for whatever was dispatched to deal with the intruders. Surface-to-air missiles (sometimes nuclear) and fighter planes were always on standby to engage the incoming aircraft. Once the interception occurred, the computer would be able to confirm that the threat was successfully eliminated or plot a new course for the next line of defense. The SAGE installations themselves were large concrete buildings with no windows and walls that were two to three feet thick. The two computers that each building housed took up an entire floor and weighed around 250 tons individually (Colon). These computers used one of the largest programs ever written at that time, which consisted of around 500,000 lines of code. This program, as well as operational data, was stored on tapes, magnetic drums, and 60,000 vacuum tubes (IBM Corporation). The computers occupied an entire floor of the direction centers, and the operators worked two floors above the actual computers where the displays were located. The displays were large, round CRT screens that would show real-time information about that section’s air traffic. The computers would also back up information about the airspace to memory as well, which meant that an operator could essentially rewind what had been shown and look at previous radar detections. This was a lot of technology to fit into one computer back then, and it was only possible because the IBM FSQ-7s were the largest computers that have ever been built. Because the SAGE computers were so large, they ended up consuming about 3 Megawatts of power. This meant they also produced a lot of heat. In order to cool the computers effectively, the direction centers had to be built above ground with large air cooling installations. While this could effectively cool the computers, it also meant that the buildings themselves were very exposed and were considered first-strike targets for the Soviet Union (Slater). When the USSR launched the Sputnik rocket in 1957, the military became even more concerned about this and eventually began to switch to a different system that used transistors instead of vacuum tubes. The SAGE computers were slowly phased out, though some direction centers remained operational until as late as the mid-1980s. The Semi-Automatic Ground Environment System never did end up seeing any actual combat, so it’s hard to judge how effective it was. However, it did result in many innovations in the computer-communications and air defense fields (Jacobs). Duluth, Minnesota was selected to house one of the direction centers for the SAGE System for two distinct reasons. First, the city already had a small airport. This meant that it was easier for the Air Force to set up a military air base as they only needed to transform and add to the current airport, rather than having to create one from scratch. Second, and more importantly, if the Soviets were going to attempt to bomb one of the United States’ main manufacturing hubs or a major city such as Detroit or Chicago, they would fly right over Duluth. The reason for this is that the planes would likely take off from right across the Bering Strait and make a straight shot for one of those cities. The bombers would have to follow that line relatively closely due to fuel constraints, and that would take them right across Minnesota and Duluth (Klosowski). As a result, the Air Force began to heavily invest in Duluth. The city’s small airport was ramped up to a major air defense base. Construction of the SAGE direction center began in 1954 and finally became operational in 1959. The center used data from radar stations located in Finland, MN, Finley, ND, and Calumet, MI as well as others. There were some located in Canada as well. Having all of the radar data run through one central location meant that the staffing for those stations could be reduced to just enough to make sure the station stayed online, while all of the monitoring could take place in Duluth. As for the data itself, most of it was transmitted to the direction center using microwave towers. With these changes to the Duluth airport, the city itself began to see a lot more activity as well. There were many more people moving to and working in the city because of the air base and as such, the base soon became the biggest contributor to Duluth’s economy (Klosowski). Many members of the community were also involved with the defense system. There were many people who worked in the city, but also piloted aircraft. There would be air raid drills where they would have to drop everything, assemble, and get airborne in under three hours. These drills would happen four to six times a year. These changes also meant that Duluth was suddenly a much more significant target for the Soviet Union. It was the first line of defense for any bombers that were coming towards the center of the United States and that made it a very valuable target. The air base and direction center were considered a first-strike target for the Soviet Union. If the Soviets were to launch just 500 of their nuclear missiles, it was predicted that Duluth would be one of the targets for those missiles. In 1961 a missile site was constructed about 15 miles north of the direction center. This site held long-range interceptor missiles. The missiles were built to intercept incoming bombers before they could get close enough to drop their payloads. Some of the missiles also included nuclear warheads. The direction center was the main controller for these missiles, being able to launch up to 28 at a time if needed. The center would then track the missiles and their targets until the interception point, which could be up to 300 miles away. If the missiles missed or did not disable all of the targets, the operators would then dispatch some of the Air Force’s or Air National Guard’s interceptor jets that were always on standby to engage. The interceptor jets that were located in Duluth were also equipped with nuclear armaments. There were 132 Air-2A Genie air-to-air missiles that were equipped with a nuclear payload stored in Duluth at one point. If the direction center deemed it necessary for an interceptor to be deployed, it was most likely going to be engaging with one of those missiles (Klosowski). Duluth’s direction center was also the line of communication to Washington if some sort of attack in their monitoring area did take place. Duluth oversaw a section of airspace that extended north to Hudson Bay and south all the way down to northern Texas. If there was any sort of attack or hostile aircraft spotted in that area the line of communication was through the direction center. There were many civilians in Duluth that were a part of the nuclear alert. This meant that there were shop owners, doctors, etc. that had day jobs, and then would go to the air base for 12, 24, or 48 hour shifts to sit on nuclear alert as a part of the Air National Guard. This was handled very seriously, people who were a part of this had to have psychological and physical exams every six months. If someone was having any sort of personal problems such as a divorce, or they were having trouble paying their bills, they were immediately taken off nuclear alert until those issues were resolved (Klosowski). Duluth also played a small part during the Cuban Missile Crisis. When the U.S. went to Defcon 2, the military began to move most of their bombers out of their normal locations in the southeastern part of the country. This was to prevent any Soviet missile strikes on high priority targets from eliminating our own armaments. Duluth housed eight B47s during that time that were fully loaded with nuclear weapons and on high alert. While the SAGE center wasn’t directly in charge of these planes, if any of the other SAGE direction centers around the country detected an attack, Duluth’s would be able to inform them as quickly as possible. In 1961 United States intelligence found that the Soviets were beginning to switch from bombers to long range missiles as their main plan of attack. As they developed their ICBMs, the U.S. Air Force cut the funding for air defenses against bombers. After about ten years, Duluth began shutting down the different sites that were related to this type of defense. In 1971, the nuclear missile site, for which the direction center was in charge, shut down and the Air Force fighter squadron was relocated to Michigan. By 1976, the Air Guard converted from air defense to tactical reconnaissance, thus ending 22 years of air defense alert in Duluth. A few years later, the radar stations that the SAGE center used began to be deactivated. This process took a couple years, but by 1983 the Air Force Base was officially closed and the direction center was no longer being used (Klosowski). At this time Minnesota’s natural resource industries were struggling. Because much of Northern Minnesota’s economy is based on these industries, it began to endanger the economy of the area, including Duluth. Leaders across many fields began to look for ways to help stimulate the economy, and eventual a proposal was written to establish a natural resource research institute at the University of Minnesota Duluth. This is important because the now-unused SAGE direction center was recommended as a site for the institute (Moran and Storch). The proposal was approved in 1983 and the Natural Resource Research Institute soon began to remodel the old SAGE building. The computers and displays were removed and replaced with the institute’s own equipment. Windows were added to the building as well. The walls on the inside were also covered by more typical walls, instead of leaving them as plain concrete. The building is still in use today and now houses labs that are used in land, water, and mineral research, as well as some technology development labs. Occasionally tours are given where you can learn some of the building’s history and its transformation from a Cold War air defense platform to a research center that dedicates itself to helping Minnesota’s businesses and environment. Moran, Ken and Storch, Neil. UMD Comes of Age: The First One Hundred Years. July 1996. Walsworth Pub Co.